We battled 50+ teams including 4 visiting World Champions from Texas, Oklahoma, and Kansas at the Stagecoach State BBQ Championships on April 24 and 25, 2009. 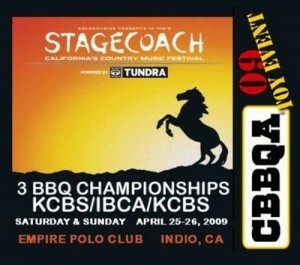 There were 3 contests in one weekend: KCBS and IBCA on Sat; and KCBS (big prize money) on Sunday. We had a very strong showing and came in 7th overall on Sat and 3rd overall on Sun. We missed Reserve Grand Champion on Sunday by 0.0004 points! That’s a scant four ten thousandths behind! Also, we won 2nd Pork Sat and 1st Pork today so we took home some mullah to help pay for contest expenses. Really ecstatic for our team’s awesome performance! We used our new 22 inch WSM for the first time in competition. FYI for those using The Stoker to automatically control temps, John Jackson has released a larger adapter and fan combo which works very well with the larger WSM. It hooks up just like the adapter/fan combo for the 18 inch WSM. In my test cooks with my 22 inch WSM, I’ve noticed that temps tend to run high (I don’t use water in the pan) even when all vents are almost closed. I was concerned that the new Stoker setup would not do a good job keeping temps from spiking. I didn’t need to worry. Now that I’ve used it in competition, I know it works extremely well. IMHO this beats having to adjust vents manually. Anything to remove another variable during a contest is a good thing because we all know that temperature consistency often results in higher placing. 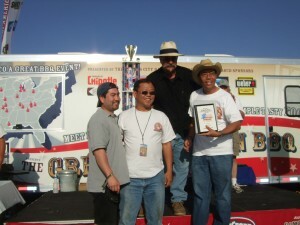 Congrats to all the BBQ winners, PC, Best Booth, Best Show and all who participated! An extra big congrats for Rhythm and Que for their double GC on Saturday! Alexa and Vince are amazingly consistent taking GC at Tempe and Hesperia before SC. It was great to finally meet some of the nationally ranked BBQ legends such as Lotta Bull and CancerSucksBBQ.com in person and cook against them. We received good advice from them to prepare for our upcoming Great American BBQ Invitational in Kansas in May. I feel we’ve matured as a second-year team and we’re very happy with our 7th place Sat and 3rd place Sunday amid such a deep field. Jason, we’ll be gunning for you and Lacey for your 0.0004 edge on us for RC. Well done Smokepranos for your first RC! Overall, we had an awesome time and got to talk to almost everyone. A special shoutout goes to Jim and Adrian of the Sweet Peppers of New Mexico because, like us, they are the second of the only two minivan teams in the West. I was very touched and glad to be part of Scottie and Jay’s BBQ efforts to donate funds fight cancer. God bless Monica, Jay’s late wife. I too experienced the loss of my wife to this terrible disease. Many thinks to Thom, Christine, staff, and volunteers for a well organized event with water, electricity, grease, ash, ice, etc. all nicely taken care of. Thanks to GV for hosting, judges, K&K, Merl, Carol, and Lynn and others for officiating the event. We had lots of helpers this year as our team was 10 person strong. Many thanks to all the helpers who came including my Assistant Cook Mark and friends and family: Wesley, Shilo, Mimi, Amy, Wendi, and Ron. The weather was fabulous this year at 85 degrees unlike last year where it was 110 degrees in the shade. Looking forward to our third SC next year! The public’s very friendly and we get to meet people like this . . . (picture by my BBQ brother Gary Notley). Enough said . . .